Is It Content Marketing or Sales Collateral? 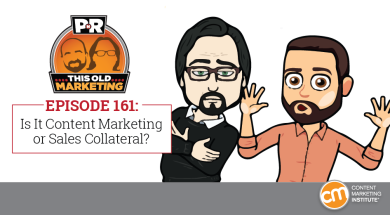 This Week in Content Marketing: Is It Content Marketing or Sales Collateral? In this episode, Robert and I debunk a blog post that insists that content marketing does not exist. We also discuss the content jobs that may be lost to machine learning and review Enterprise’s launch of “sales collateral posing as a digital magazine.” Rants and raves include Kendall Jenner’s Instagram supremacy and PewDiePie’s lucrative PR stunt, then we wrap up with an example of the week from Constant Contact. Is content marketing failing B2B businesses? (08:20): In a recent blog post, U.K.-based B2B marketer Heidi Taylor takes issue with the idea that content marketing is emerging from the “trough of disillusionment,” as asserted in CMI’s 2017 Benchmarks, Budgets, and Trends research. Though we appreciate her perspective — and even agree with some of her points — we believe that she is redistributing the facts to fit the narrative she wants to create. We respond by airing our concerns with some of the faulty correlations and contradictory conclusions she has drawn. Will artificial intelligence replace writers and content marketers? (21:30): In an article posted on the Marketing Artificial Intelligence Institute blog, our friends at PR 20/20 address the question of whether artificial intelligence will soon automate content marketing to the extent that we no longer need human writers for content creation. Personally, I believe great writers will always be in demand for the quality and creativity of their work; however, as bots are already starting to take over some of the more commoditized content efforts, Robert is curious to see how those writers will adapt when automation gives them more time to pursue human-differentiated content efforts. Enterprise embraces content marketing with digital magazine (33:56): MediaPost’s Marketing Daily blog brings the news that Enterprise Rent-A-Car is launching a new travel magazine, which comes on the heels of the brand’s new digital strategy. Pursuits with Enterprise will use a combination of search, paid social, email, and digital advertising to build awareness and drive traffic. While we love the idea of creating a customer-loyalty-driven content experience, Robert and I agree that the corporate packaging of this particular effort places it in the realm of sales collateral, not valuable content. Content Marketing Institute’s 2017 events: Whether you are just getting started with content marketing or are looking to take your expertise to the next level, CMI’s portfolio of events has you covered. From our free virtual ContentTECH conference, to our strategy-focused Intelligent Content Conference, to Content Marketing World — the largest annual gathering of content marketing professionals in the industry — we offer a wide range of unparalleled training, education, and networking experiences. Check out all the events we have in store for 2017, and sign up for the ones that fit your needs. Robert’s commentary No. 2: Robert discovered a fascinating story at Business Insider about media investment company GroupM’s new data-and-technology unit, which aims to create a rival to Google, Facebook, and Apple ID. MPlatform is a piece of code that will aggregate consumers’ data as they move across multiple media touchpoints and platforms, making it easier for GroupM clients to target them with advertising. Robert ponders the irony of this initiative, given that a content marketing approach would have helped them achieve similar capabilities without the need for all the tech bells and whistles. Joe’s commentary No. 2: Last week, we mentioned internet-famous videoblogger PewDiePie’s reactionary decision to close his YouTube channel in response to unfavorable algorithm changes on the channel. No one should be surprised to find out that his threats turned out to be mostly empty (he did delete a separate account he owned); but what I did find to be interesting was the multiple millions of dollars-worth of PR coverage the stunt likely generated for him and his personal media brand. Constant Contact: Something we often talk about during our Content Marketing Master Class series is the popular “Jobs to Be Done” framework, which is a means for achieving value through building an audience. Dave Charest from Constant Contact recently reached out to Robert to share details of a program the company has built on this framework. Rather than simply interviewing customers as a way to inform its content marketing personas, the company decided to turn its fact-finding process into a whole new content platform. The result? The Small Biz Stories podcast, which now engages Constant Contact’s audience with inspiring, behind-the-scenes anecdotes from the trenches of small business and has spawned a related series of posts for the company’s blog (including this one on how to speak to many by writing to one) and a customer training program. But even more important is that the initiative has given Constant Contact a deeper — and more actionable — understanding of its customers’ needs, their motivations, and the forces that drive them to take action. It’s a remarkably creative way of informing the content marketing process, while serving as an innovatively “meta” illustration of This Old Marketing at its best.